Many books these days take place in two time periods. Not time travel. Telling a story that combines past and present that interconnect. Some do it well, some don’t. The Lost Castle by Kristy Cambron does it quite well. I thank TLC Book Tours for sending me a copy at no charge for my honest review. 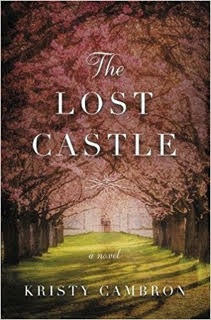 The Lost Castle drew me in from the first page and from there I had a hard time putting it down. The tale involves a young woman named Ellie who was raised by her grandmother who is now in the late stages of dementia. As her grandmother slowly declines she suddenly seems agitated about something. Something she can’t fully express or explain to Ellie. She starts talking about a past that Ellie knew nothing about. A past that seems alien to the grandmother that Ellie knew. Ellie ends up with a photograph and a story about a man that was not her grandfather. The photo is of a small castle in France. So off Ellie goes to try and unlock what her grandmother is trying to tell her. Ellie is the kind of character you can get behind when reading a book. You want to root for her in her search. The book toggles back and forth telling the story of Ellie’s search for answers and her grandmother’s experiences during the War. It was a part of her history that she didn’t share so Ellie does not know what she will find as she searches. It leads her to a winery with a history that is even deeper. It’s story winds into the telling and ends up answering a question that had lingered for quite some time. This is a story of revolution and war. Love and hate and passion. The reader needs to just let it happen for full enjoyment of Ms. Cambron’s writing. It is a little silly at times but just ignore your brain when it’s telling you that. The joy of a book like this is the romance and the road to answers. The Lost Castle takes the reader on a trip that is full of that joy and passion as well as loss and pain but you end up in place that brings a true happiness at the end.